At 3 P.M. February 7, 1862, Union forces under Gen. Ambrose Burnside landed at Ashby Harbor. By midnight 7,500 Federals were ashore. A Confederate force of 400 men and 3 field-pieces was sent to resist the Federal landing. 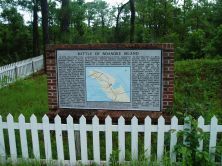 The Confederates were driven away by gunfire from the Federal fleet in Croatan Sound. The Confederates withdrew north along the only road on the island, situated a little to the west of the present State Highway 345, across which a line of breastworks had been constructed to delay the Federal advance. The Confederates relied on the swamps on each side of the road to protect their flanks. The Confederate right and left flanks were protected by skirmishers. The Federal 1st Brigade assaulted the Confederates in front, supported by 6 cannon. Federal infantry attempted to advance, but were repulsed by heavy Confederate fire. Troops were ordered into the swamp to crush the Confederate left. At this time Gen. J. L. Reno arrived with four regiments of the Federal 2nd Brigade, which he moved through the swamp against the Confederate right. By the time the Federals reached both flanks of the Confederate position, Gen. J. G. Parke, commanding the Federal 3rd Brigade, arrived and made an attack upon the Confederate front. Under pressure from three sides, the Confederates withdrew to the northern end of the island. Additional Confederate forces arrived in time to become involved in the retreat. One hour later the Confederate commander surrendered his entire force, 2,488 men, to Gen. Burnside. 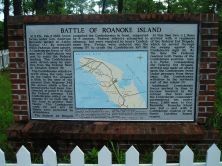 Roanoke Island was lost--and with it Confederate control of the North Carolina Sound region. CONFEDERATE TROOPS ENGAGED: Company B, 8th and Companies B, F, and E, 31st North Carolina Regiments; Companies E and K, 59th, two companies of the 46th, and one company of the 49th Virginia Regiment. 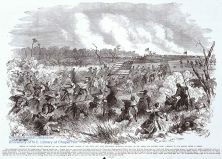 FEDERAL TROOPS ENGAGED: 21st, 23rd, 25th, and 27th Massachusetts Regiments; 9th and 51st New York Regiments; 9th New Jersey Regiment; 10th Connecticut Regiment. Total number of troops engaged: Federal: over 5,000; Confederate: 400.